JP Drop-in .156" Small pin AR fire control kit include: Trigger, Disconnector, Speed Hammer, Oversize Anti-Walk Pins and Adjustable/Reversible Selector and Springs. The standard spring sets included in all JP Fire Control kits include the yellow hammer and trigger springs, which may be used for competition and recreational applications with hand loads or domestic made non-military ammunition. The yellow/yellow combination results in a release weight in the 3.0-3.5 lb range on most receivers. Also included Is the red hammer spring for use with military (5.56 NATO) or foreign manufactured ammo with low sensitivity primers. The red hammer spring MUST be used on any tactical duty (LE) installations and any AR-10 type installation for 100% ignition reliability. The yellow/red combination results in a release weight of 3.5-4.0 lbs on most receivers. 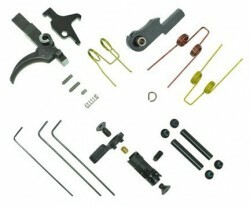 The tactical spring set includes a full powers (grey) hammer spring and yellow trigger spring. It may be required for agencies that specify a trigger release weight of over 4 lbs mandatory. This set up also insures 100% ignition reliability on both AR-15 and AR-10 type rifles. To meet NRA Service Rifle Competition rules of a 4.5 lb release weight, order the CMP spring set up which includes the full power grey hammer spring and a custom trigger return spring (also grey) which will allow you to tune to a release weight just over 4.5 pounds to lift the NRA weights.